As this book is written by a comic actress you would rightly expect it to be very funny. It is a funny book, however I actually found the jokes to be a distraction in the first few pages. I felt like Kristen Johnston was giving the reader the version of herself she thought they expected, and she didn’t want to let them down. I wondered if this is how Johnston is when you first meet her in person. That she uses humor as her armor, creating an illusion of openness and intimacy, which actually deflected you from seeing who she really was or what was really going on. If you are looking for a ‘celebrity memoir,’ with funny anecdotes about famous people, you are going to be disappointed. Johnston barely touches on her upbringing, rise to fame, or acclaimed career as an actress. They are mentioned in passing; instead, the book is an invitation into the soul of an addict as they battle their fear and denial. There were two parts of the book in particular that made me shudder with recognition. The first is where she describes witnessing her brother’s bullying. With no means of voicing her feelings, she violently lashes out at one of his tormentors. Describing this as one of her many ‘ill-advised decisions’, I felt it was actually a truthful reaction to extraordinary pain. She had no other way to express how she felt except violence. Her feelings were demanding a release. This type of irrational, compulsive behavior is ‘normal’ in someone who has learnt to protect their inner world, by building a wall around themselves. It should therefore come as no surprise, that this little girl grew up to become addicted to ‘pain pills’ as an adult. It was inevitable that she was going to have to find a way to numb the pain of feelings she could never dare express. The second incident that touched me, is when the first crack in her wall first begins to show. Johnston has been admitted to a hospital in England for life saving surgery, when her intestines literally burst from all the drugs she had been taking. Because she is in so much pain and can barely move, she has to ask a nurse to help her wash her hair. As an adult, she realizes this is the first time she has ever asked anyone for help. Ever. By this point in the book, her loneliness and isolation are palpable, and the simple act, of another human being tenderly washing her, is almost heart breaking. It’s clear that Johnston has never let anyone in and the sheer thought of it terrifies her. The reason this book should be compelling reading for any addict or alcoholic, is just how much Johnston reveals of the inner life of an addict. She rightfully claims to being completely unoriginal in her feelings and behavior; her experience of addiction is just like anyone else’s. Addicts will do anything to prevent anyone seeing who they really are, they will fight tooth and nail to defend the wall they have built around themselves. Johnston is certainly no different. Like many addicts Johnston paints a picture of determined self-reliance. Believing she can just power through anything with her grit and determination. Unwilling and unable to face up to her reality, I believe it was no coincidence that her body finally forces her to see what her mind refuses to. Thousands of miles away from home, friends and family; unable to work, she could do nothing but stare at the ceiling and contemplate how things have ended up this way. Too weak to fight and with no distractions, the wall she had built around herself slowly begins to crack. Inevitably, when that wall cracks, grief, loss and loneliness flood in. Johnston shares all of this with the reader. Then, for someone who has determinedly hidden her true self from the world, she begins to discover who she really is, for the very first time. Vulnerable, scared and very lost she begins the journey back to herself. The miracle of recovery is, that despite everything we have believed about ourselves, who we really are is glorious. We don’t need to hide or be alone anymore because who we really are is just fine. 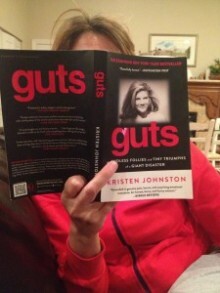 This book convinces you that if Kristen Johnston can discover this, then so can you. Because of her stature, Johnston has often been referred to as ‘Amazonian.’ The description fits her not because of her height, but because she is a warrior. Guts is the account of a lone warrior battling to stay in denial before finally waging the courageous battle of sobriety.